Make Learning A Habit With Your #LanguageDaily Printable Calendar! Looking to make language learning a bigger part of your daily life? We’ve made this useful calendar to help you turn your language learning into a real habit, and not just an aspiration. 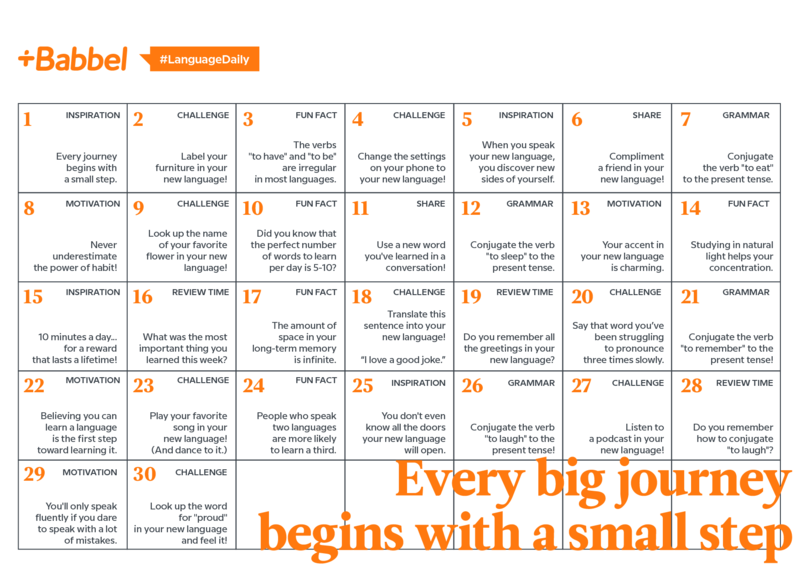 This September, Babbel is rolling out a month-long initiative on our Instagram feed called #LanguageDaily. (If you’ve wandered over here from our Instagram, welcome!) What’s the premise behind this drive, you ask? It’s simple: The key to successful language learning is to make it a daily habit and learn a little each day. We suggest hanging this guy anywhere you’re likely to see it: on your fridge, at your desk, on your bathroom mirror, or anywhere else you see fit. Want more tips, tricks and resources to make your language learning a real habit? Stay tuned to our Instagram page — and don’t forget to follow us!